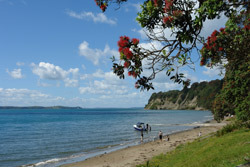 Martins Bay Holiday Park is situated on the Mahurangi Peninsula, past Snells Beach and Algies Bay, facing Kawau Island and the islands of the Hauraki Gulf, beside Scandrett Regional Park. In the Rodney District you may also like to visit Orewa Top 10 Holiday Park and Whangateau Holiday Park. For a map and driving directions to Martins Bay click here . For more information about things to do in Martins Bay and the surrounding region click here.